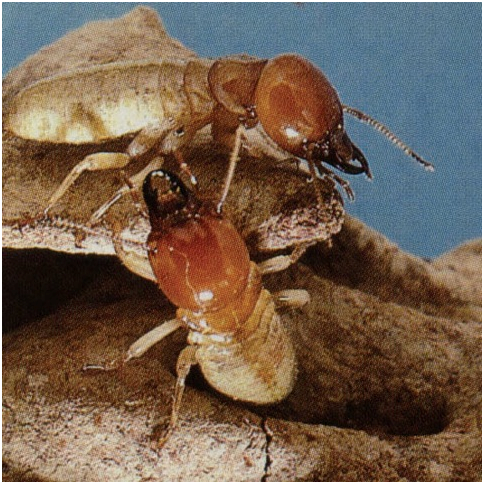 Most people have heard of termites; not everyone has seen termite pictures. 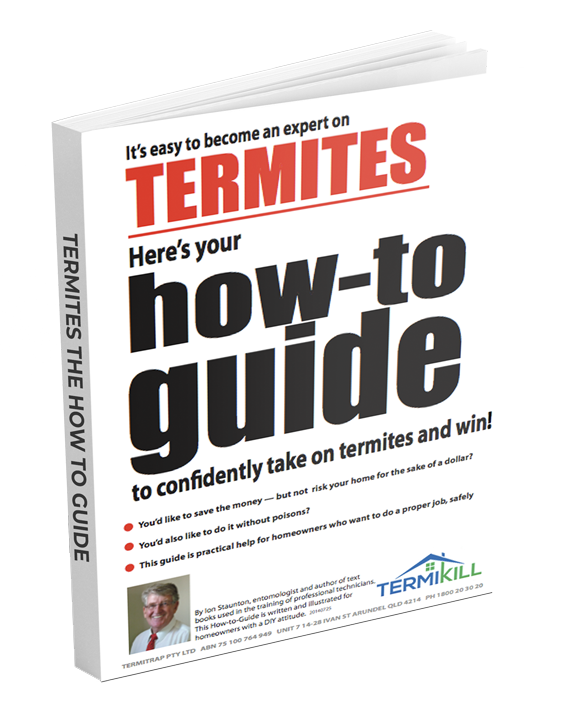 Skim through these and you’ll have a better idea of who, what, where, when and why they are the cause of so much damage to our homes and how we can do a lot more than just leave it to the pest professionals. DIY termite control has arrived. 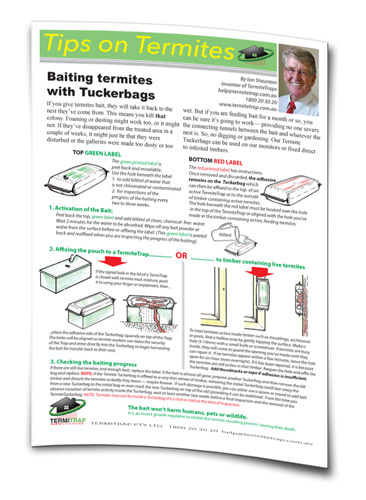 These illustrations should encourage you to confidently join the ranks of the DIY termite killers. 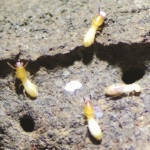 The first time you see termites it will probably be accidental. 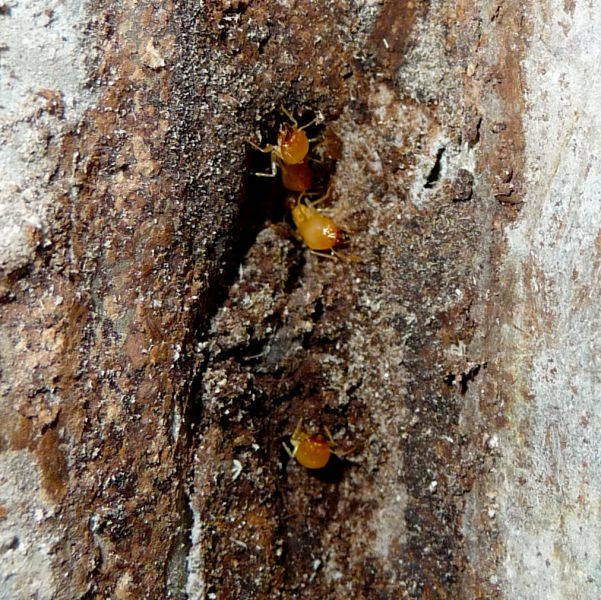 You’ll move a piece of timber you’ve kept until it came in handy, or a log, or you’ll bump a skirting board… then you’ll know why ‘they’ called them “white ants”. 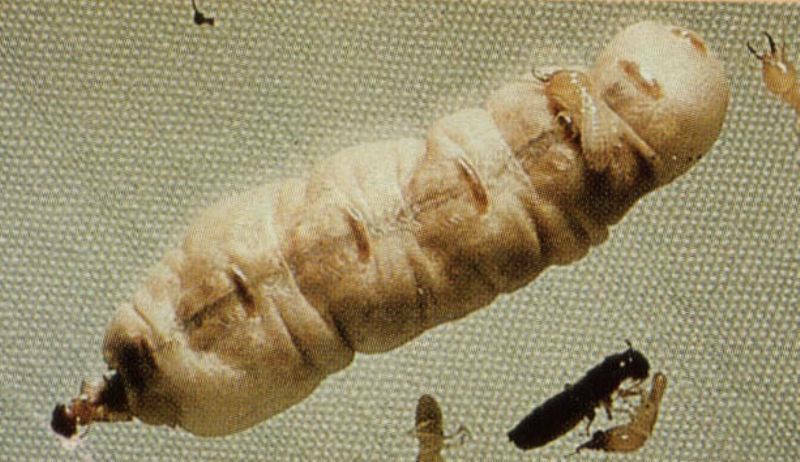 This is a Coptotermes queen. she has become an egg-laying ‘factory’. The soldier on her back is about 7mm long, which makes her about 56 mm long, and you’ll notice her head is similar size to the soldier’s. 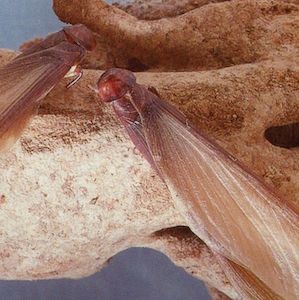 These are winged reproductives, almost ready for their colonising flight. They are waiting for the outside climatic conditions to match those inside the nest: about 80% humidity and 25 C plus. If you find soldiers with this type of ‘pointy’ head, you’re “lucky” because they come from mounds. Look about, find and physically destroy the mound and they are no longer a problem. They are the Nasutitermes species. These major Schedotermes soldiers are defending the access back to their nest after the builders had stripped out all the damaged timber framework. This hole is in the low corner of two concrete walls. If no baiting is done to kill off the colony before the repairs are commenced, the colony will be back and thank you very much for the fresh new timber. These are Mastotermes soldiers. This species are about 13-15 mm long (about twice as big as most other species). Notice they have a tooth on their jaws. They damage timber much faster than others but they are native to north of the Tropic of Capricorn and seldom found in sub tropical climates. 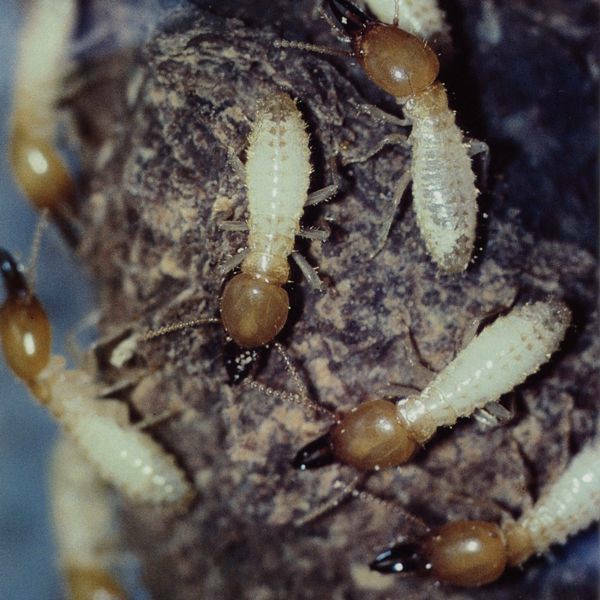 The most destructive termites are the Coptotermes species. Their soldiers have a brown, avocado-shaped head and the jaws do not have teeth or serrations. You can’t say they are not industrious. 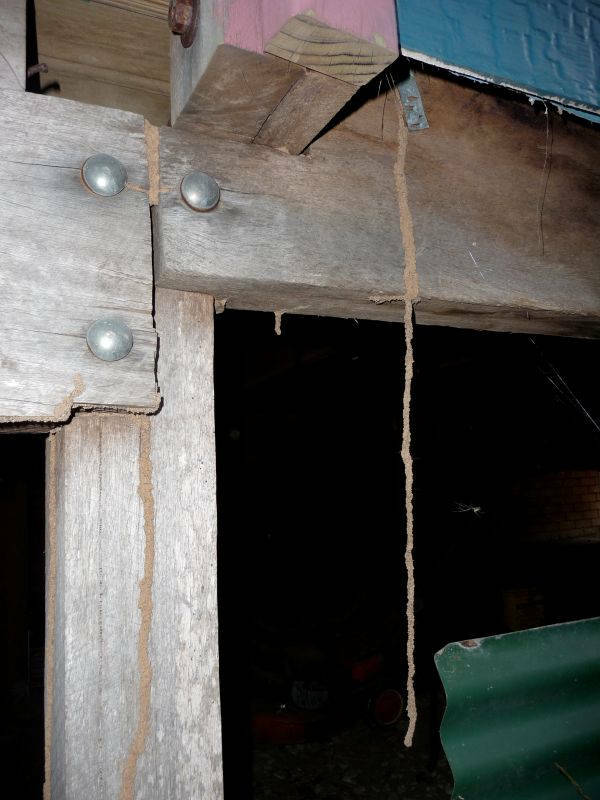 These termites first built their tunnel up the timber post from the ground and you can see the mud in the gap between the bolt heads. It seems like they had a committee meeting and decided a short cut home was in order so the construction team began to build a ‘stalagtite’ to the ground about one metre below. You might wonder why they went up the outside of the post? It is hardwood and they were only interested in eating the pine flooring which was also partially decay affected. There are workers and soldiers in this photo. You can see the contents of the abdomen of the workers which also have rounded, white heads. The few soldiers (top, just left of centre) has a browner head and black jaws visible out in front. Just below centre and to the right, you’ll see the head of a larger soldier. Schedorhinotermes intermedius have two soldier castes, major and minor. 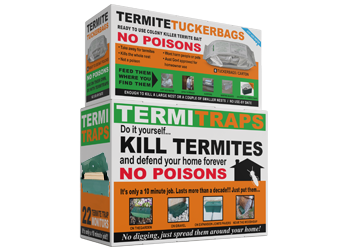 These are one of the most widespread and damaging pest species and they are especially shy and if disturbed may not be back for weeks, months or ever. Copto soldiers have an avocado shaped tan coloured head, the jaws protude out front and have no teeth. Often they will emit a white globule of a sticky substance to assist their defensive capabilities. This must have been a shock. 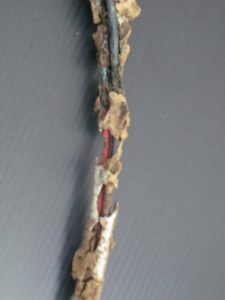 The plastic insulation of this in-wall electrical wiring was eaten by Coptos and exposed the copper wire in places. A short-out occurs and if there isn’t a Safety Switch, there could be a fire. Anyway, the lights go out and it would take a genius electrician to work out where and why. Invitation to a termite scout. 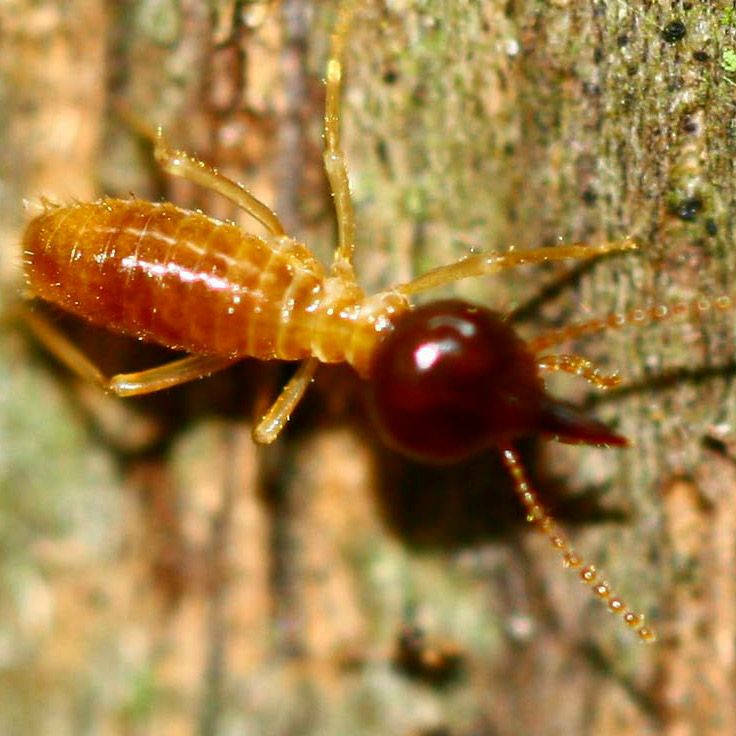 If you’ve ever wondered how termites know there is timber “up there” somewhere, this could partially explain it. Here is the building sequence: the concrete footings and slab is poured, the timber frame is erected (and then there were two days of rain resulting in the stain running down over the concrete into the soil). Next the brick or block wall is erected starting on the ledge. Then the concrete pathway or landscaping is butted up to the new wall. 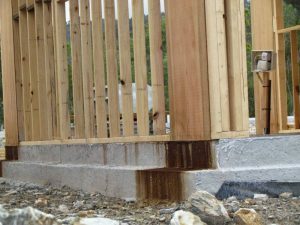 A chemical barrier is supposed to be applied around the base of the wall before any path is laid but this seldom happens or if it does, the concreters usually disturb or breach it during their preparation. The building is finished. Now it is over to the scouts from any nearby termite colony. That stain is an indicator that trace indicators of resin, fungal spores — anything from the wood, has seeped into the soil. A scout detecting these indicators then goes “upstream” towards the source. 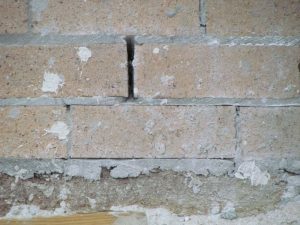 The photo below shows how gaps may be left where the first row of bricks were laid on the slab edge. A hole 3mm or bigger is enough for them to get through under and behind the dampcourse up into the frame. 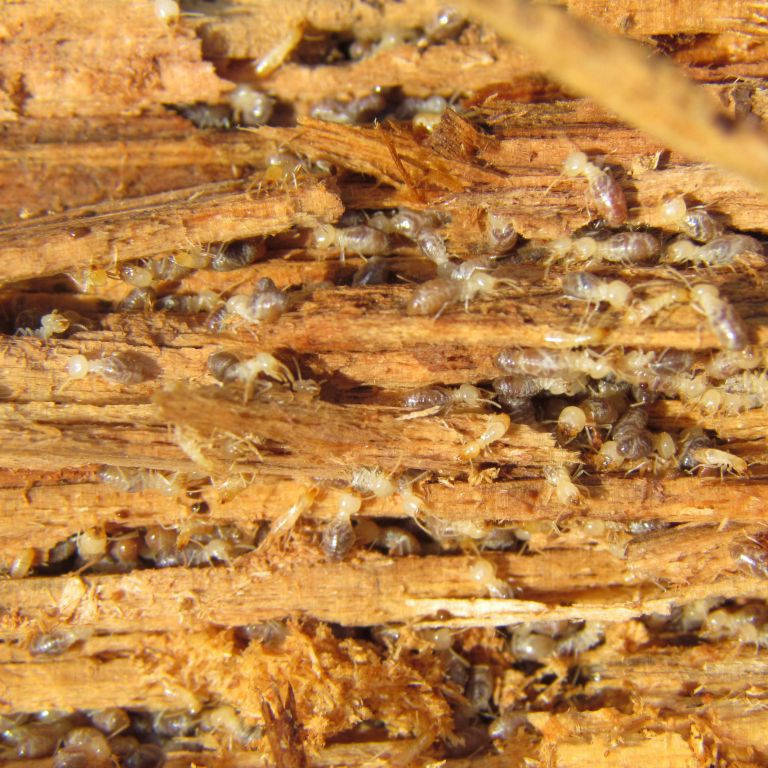 As all the timbers in a building are joined to each other, termites can get to everything and hollow it out. This form of “keyhole surgery” or “liposuction” removes the strength of the building though the tiny opening below ground level. 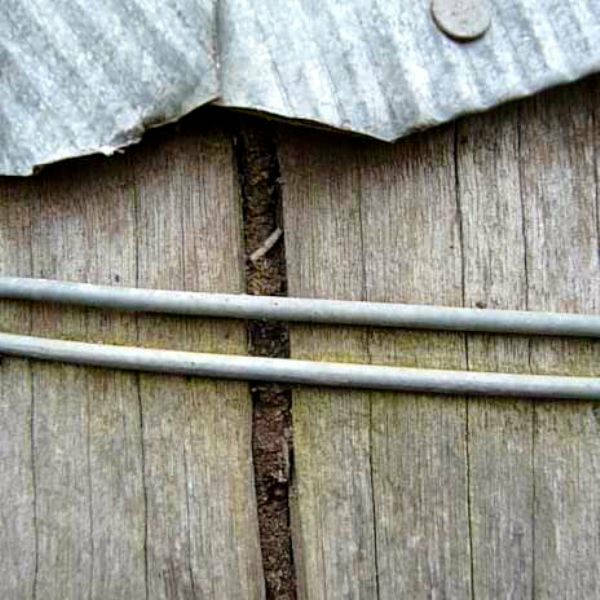 This is why you should inspect your home at least once a year to detect incipient damage before it becomes a major issue. 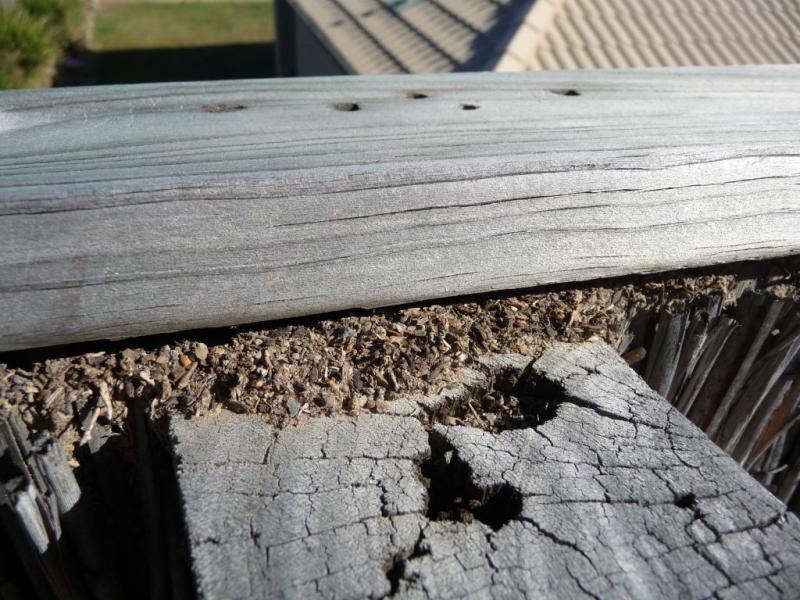 Termites have used a mud mixture which is hard and brittle to fill up the split in this fence post. Some ants also fill up gaps but theirs is a mixture of wood and grass particles held together with silk webbing. 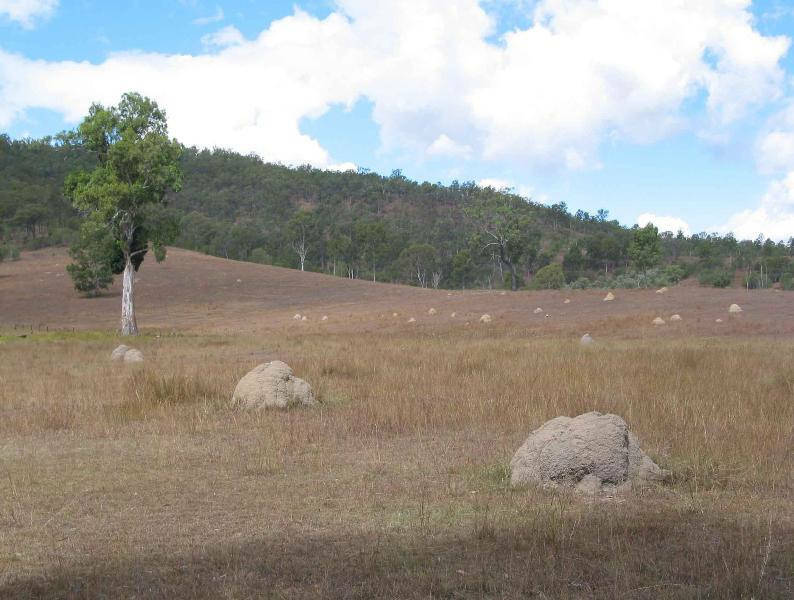 The tall narrow mound is the Magnetic termite Amitermes. The long axis of the mound is north/south to reduce heat gain in the midday sun. 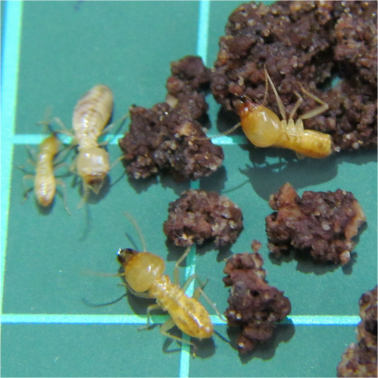 These termites are grass and leaf-litter eaters. Notice the number of mounds of these Nasutes up on the distant hillside. It indicates the number and spacing of colonies that may be found in urban and suburban areas.